Artworks can make visible the success of their makers, but to understand the struggles that produced them, and so the triumph they represented, something more is needed. Paul Cézanne was an artist who mastered his chops long before he was accepted by the gatekeepers, and the stories of his masterworks, and the fates that befell them, often prove powerfully moving. His “Portrait of the painter Achilles Emperaire,” an image that, once seen, stays in the mind, expressed an abiding affection for a friend and fellow-worker, but its resemblance—possibly accidental, perhaps not—to a political scandal of the day consigned it to rejection and obscurity until long after both men were dead. 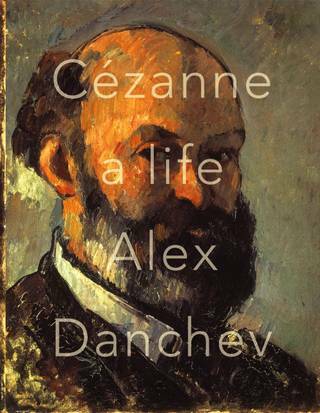 Alex Danchev tells this story and many more in Cézanne, A Life, a book that adroitly balances exhaustive documentation with narrative vitality and deeply-felt sympathy. History tells us more about Paul Cézanne than it does about Shakespeare, the person whose significance as artist is so often invoked when discussing the ground-breaking painter. Yet in the years since Cézanne’s death just over a century ago, interest in the art maker has become as suspect as the virtue of beauty—an irrelevant and problematic distraction that shouldn’t be allowed to color responses to the works themselves. Still, the effort goes on to sort through the legends that grew up in the vacuum of hard evidence for either man. Alex Danchev has seemingly tracked down not only every qualified fact about his subject, but freshly translated every letter written by or to the artist, including some that were never sent. He’s also catalogued comments by relevant artists, critics, poets, novelists, essayists, philosophers, and even politicians. While it’s not true that the mundane events of Cézanne’s life get lost in all this data, the narrative thread often pops up unexpectedly from amid long summaries of sometimes contemporary, sometimes anachronistic observations and comments. In such moments, life events resemble so many painted under-painted highlights, or the notorious ‘empty’ spots Cézanne left open to let paper or canvas show through. This resemblance, between the writing and the art it presents, brings readers closer to the painter as art maker than seemed possible for the reclusive and famously irascible Cézanne. The ideal approach to Cézanne is through his painting, but few in his audience have the skills to do so directly. Instead, we know him through the decidedly partisan account that makes up recent art history, according to which modern painting evolved through a single line, discernible only in hindsight. Thus a brief decade of impressionism broke the stranglehold of academic art, followed by a post-impressionist reaction that was led by Gauguin, Van Gogh, and Cézanne, among others. Yet Cézanne, who never met Van Gogh and was deeply offended by Gauguin, found his closest friend, ally, and influence in Pissarro. As this book shows, they all considered themselves at one time to be impressionists, and differed as much as anyone in their opinions of each other. Of course history is more art than science, and historians use many tools to blend and smooth the welter of irreconcilable data they confront—just as most painters do to unify the surface of their canvas. As biographer, Danchev moves in the other direction—from the general era to the specific individual—and restores details the historian must omit to make events fit the desired shape. His previous biography, of George Braque, was called a junk house of notes by one reviewer, and at times he seems to have done too well the task of giving the notoriously self-mystifying Cézanne back the thickets and brambles of his strange life. Yet as Danchev’s somewhat desultory campaign demolishes one myth after another about his character and how he painted, there gradually emerges a far more approachable figure, more convincingly depicted. Once-inexplicable mysteries give up at least some of their secrets. The woman who was his model, companion, the mother of his son, and eventually his wife emerges from the disparaging image created by her natural enemies and begins to display the positive, even intriguing traits he saw in her. The fate of his friendship with Emile Zola similarly shrugs off decades of misinterpretation, jealousy on more than one part yielding to the authentic, heart-breaking consequences on love of life’s accidents. And of course what a painter discovered at the dawn of the twentieth century must also be true for a biographer working at the dawn of the twenty-first. Credit, then, to Alex Danchev, in whose manageably-sized tome (373 pages, plus a wealth of illustrations in color and b&w and, for those so inclined, excellent notes and sources) Paul Cézanne does not disintegrate, but like the subjects of his paintings, becomes more solid, more real, and his image more expressive of nature. Until today, no one knows for sure how Cézanne was able to capture fragmentary reality without losing its materiality in the process. No words can describe or explain it, but Cézanne, A Life does show how it’s done.